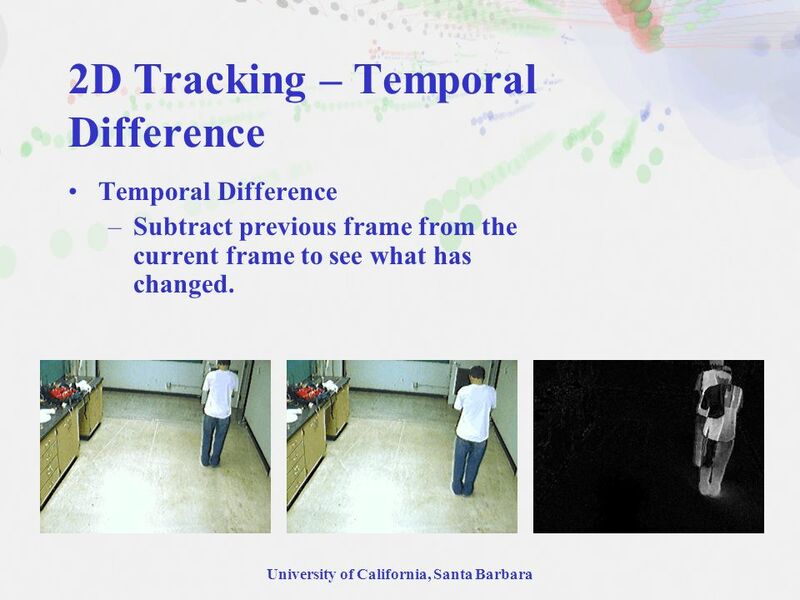 5 University of California, Santa Barbara 2D Tracking – Temporal Difference Temporal Difference –Subtract previous frame from the current frame to see what has changed. 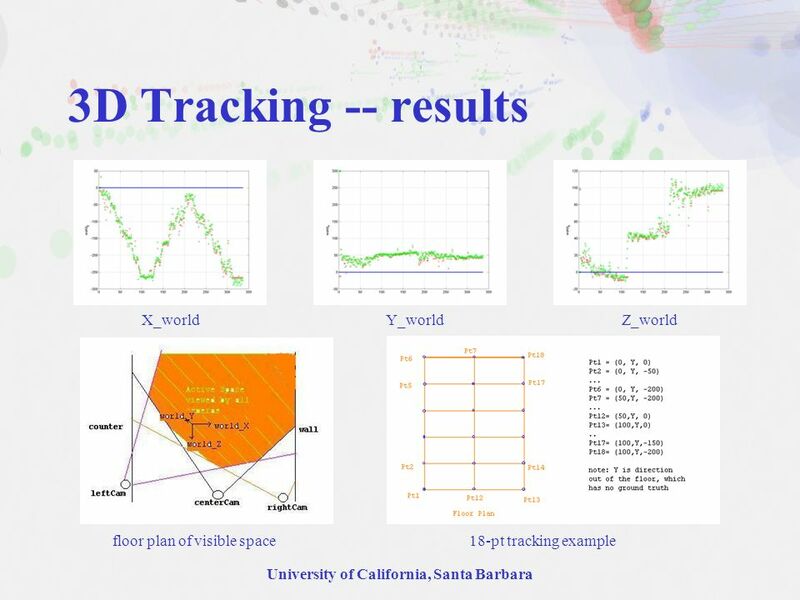 8 University of California, Santa Barbara 2D Tracking – Center of Mass For now, we assume that only one object is being tracked. 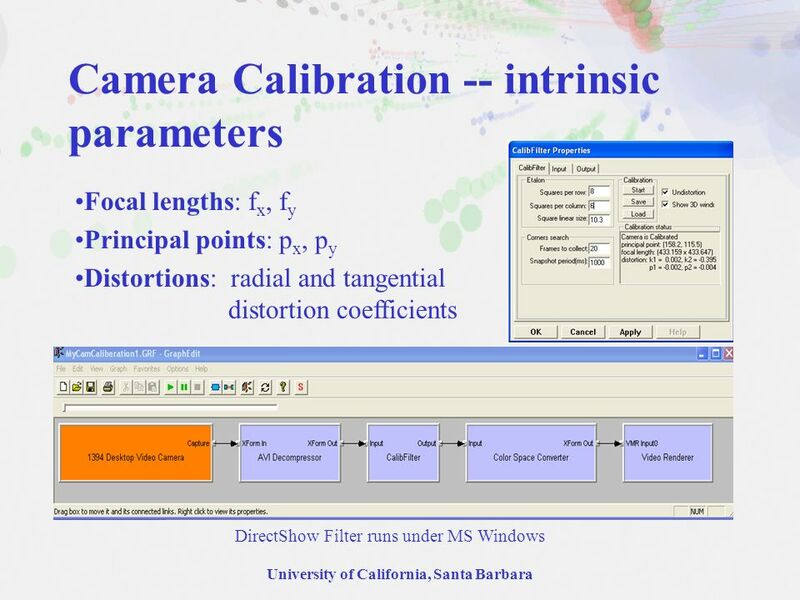 Thus, the image center of mass approximates the object center of mass. 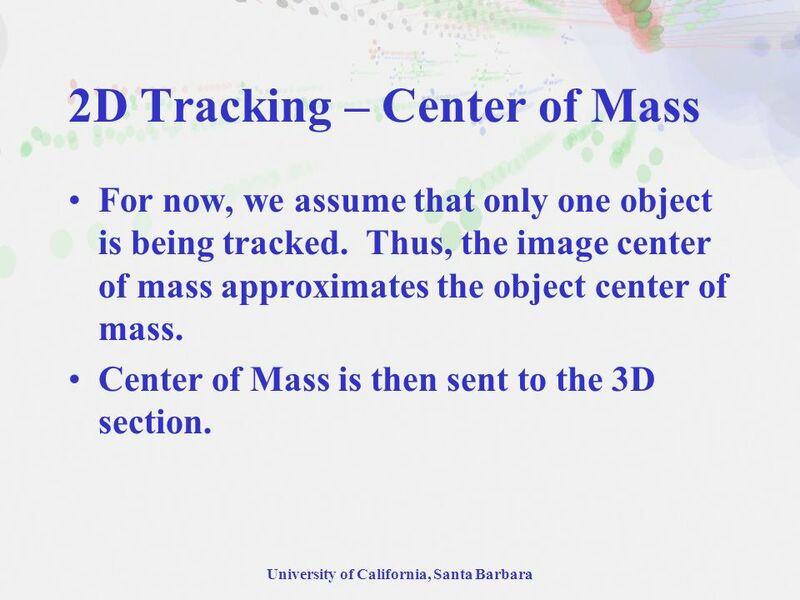 Center of Mass is then sent to the 3D section. 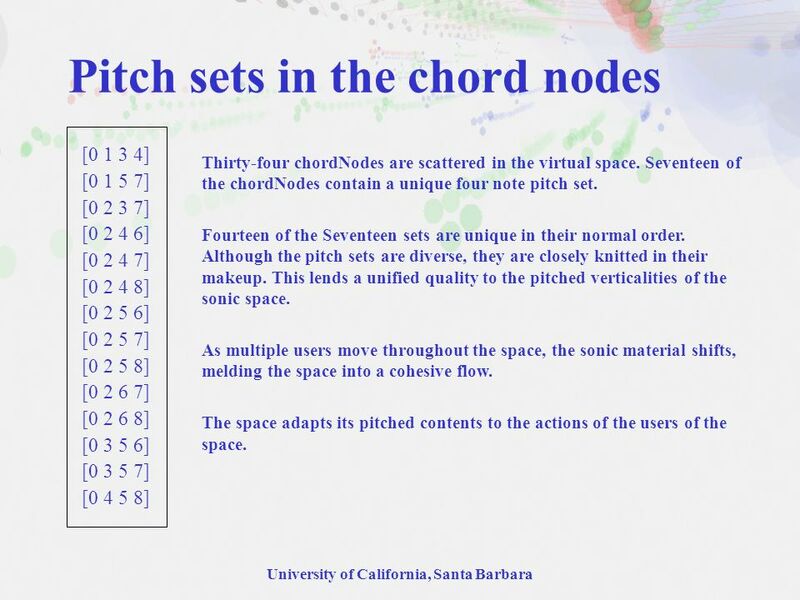 19 University of California, Santa Barbara Pitch sets in the chord nodes [0 1 3 4] [0 1 5 7] [0 2 3 7] [0 2 4 6] [0 2 4 7] [0 2 4 8] [0 2 5 6] [0 2 5 7] [0 2 5 8] [0 2 6 7] [0 2 6 8] [0 3 5 6] [0 3 5 7] [0 4 5 8] Thirty-four chordNodes are scattered in the virtual space. 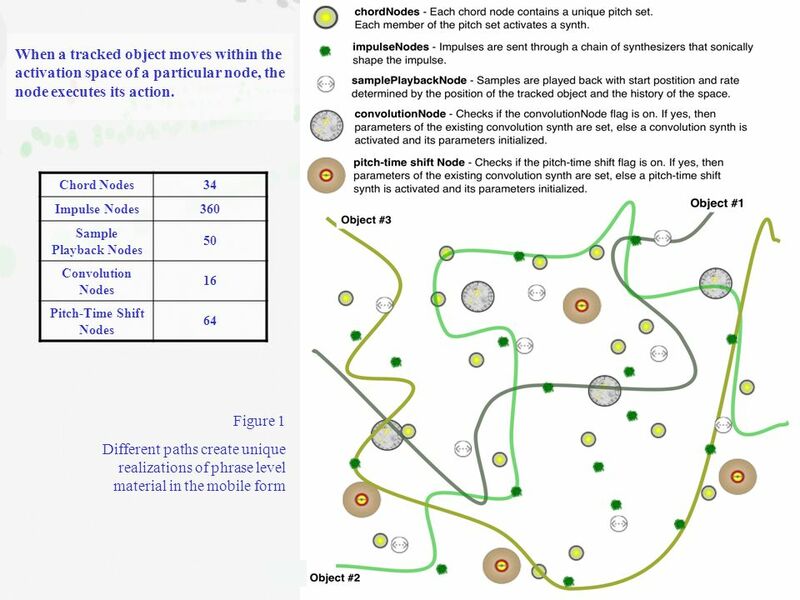 Seventeen of the chordNodes contain a unique four note pitch set. Fourteen of the Seventeen sets are unique in their normal order. Although the pitch sets are diverse, they are closely knitted in their makeup. 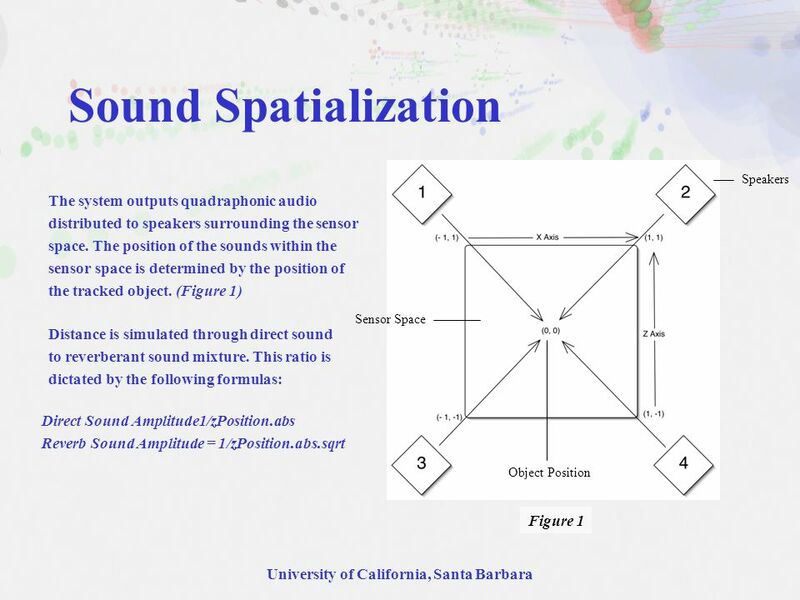 This lends a unified quality to the pitched verticalities of the sonic space. 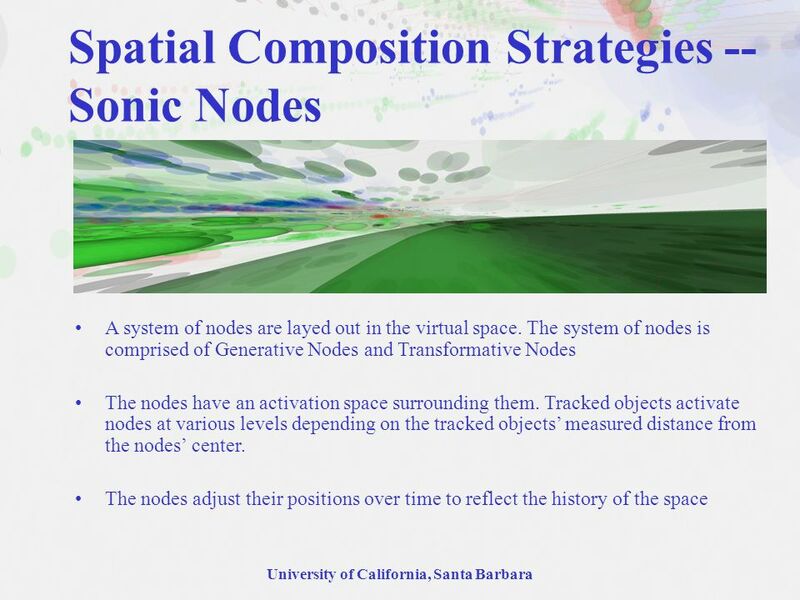 As multiple users move throughout the space, the sonic material shifts, melding the space into a cohesive flow. 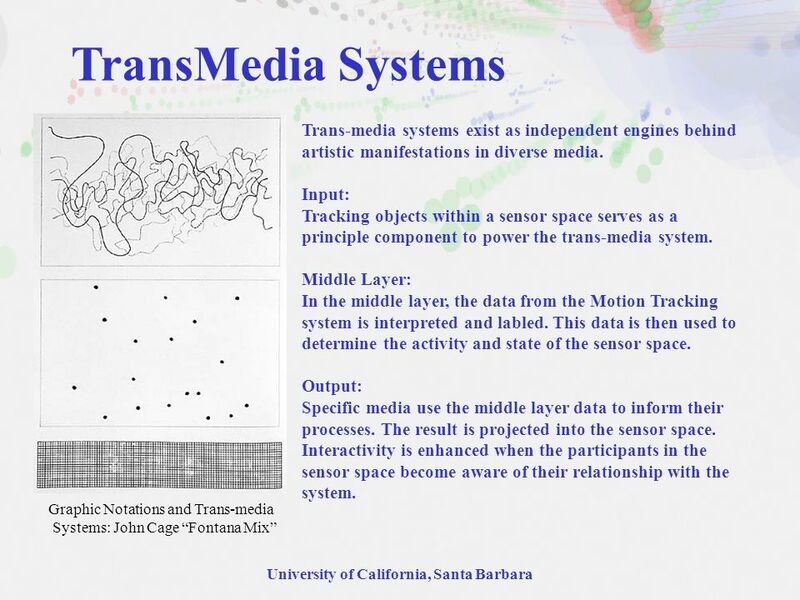 The space adapts its pitched contents to the actions of the users of the space. 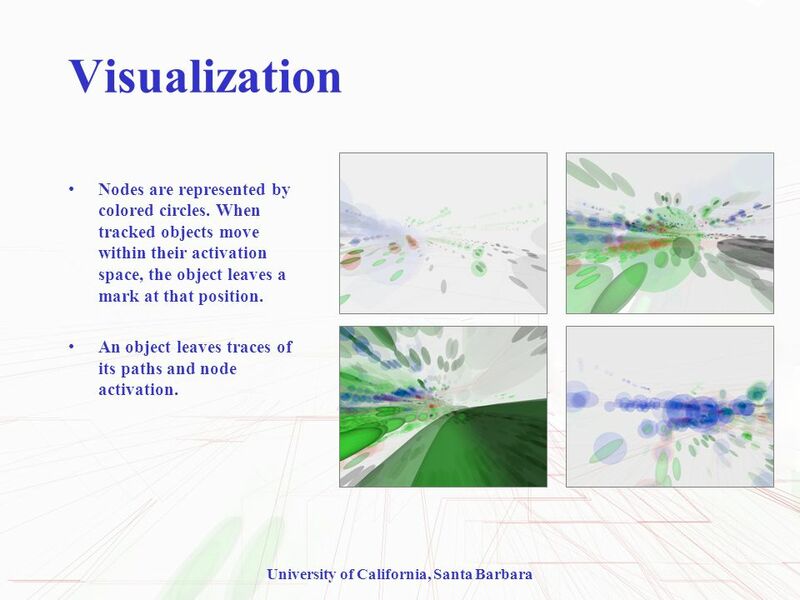 22 University of California, Santa Barbara Future Work Improve the system by enabling the tracking of multiple objects as well as incorporating features such as shape, size, and color. 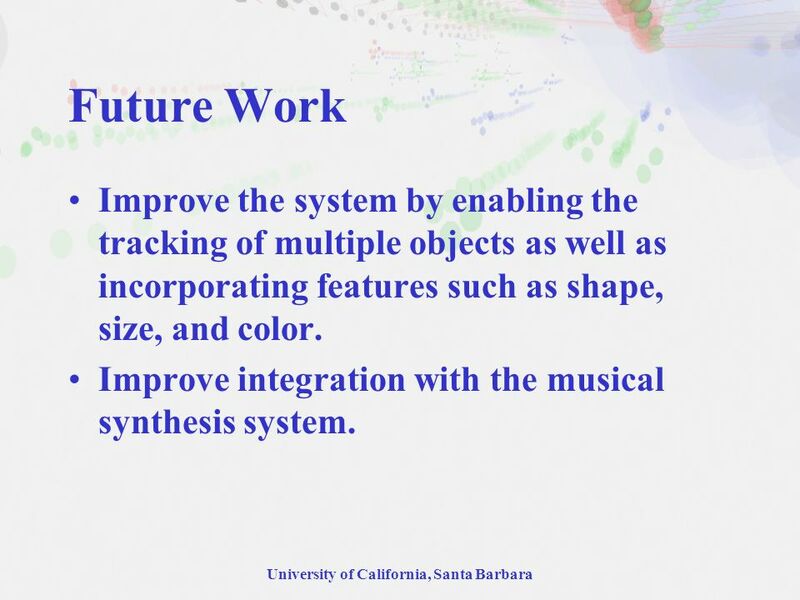 Improve integration with the musical synthesis system. 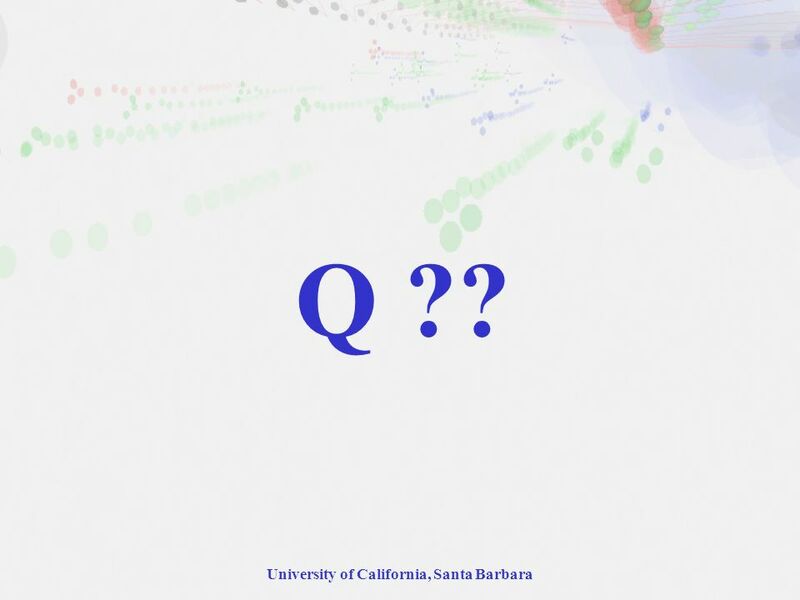 24 University of California, Santa Barbara Q ?? 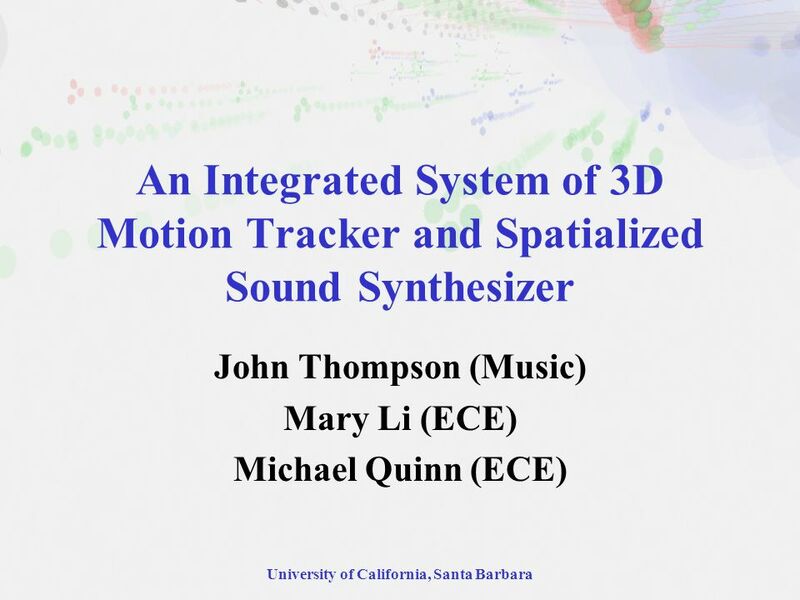 Download ppt "University of California, Santa Barbara An Integrated System of 3D Motion Tracker and Spatialized Sound Synthesizer John Thompson (Music) Mary Li (ECE)"
Miroslav Hlaváč Martin Kozák Fish position determination in 3D space by stereo vision. Development of a system to reproduce the drainage from Tsujun Bridge for environment education Hikari Takehara Kumamoto National College of Technology. 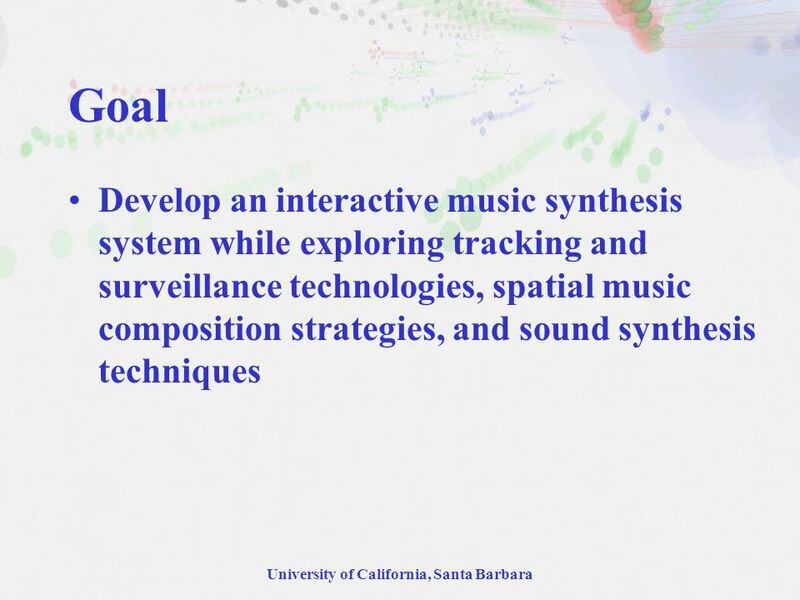 NSF REU JULY 27 TH, 2012 Sound Pixel Project. Building a Frame Design Concept  Transportable, study, and easily constructed Material: 80/20  Lightweight. Vision Based Control Motion Matt Baker Kevin VanDyke. 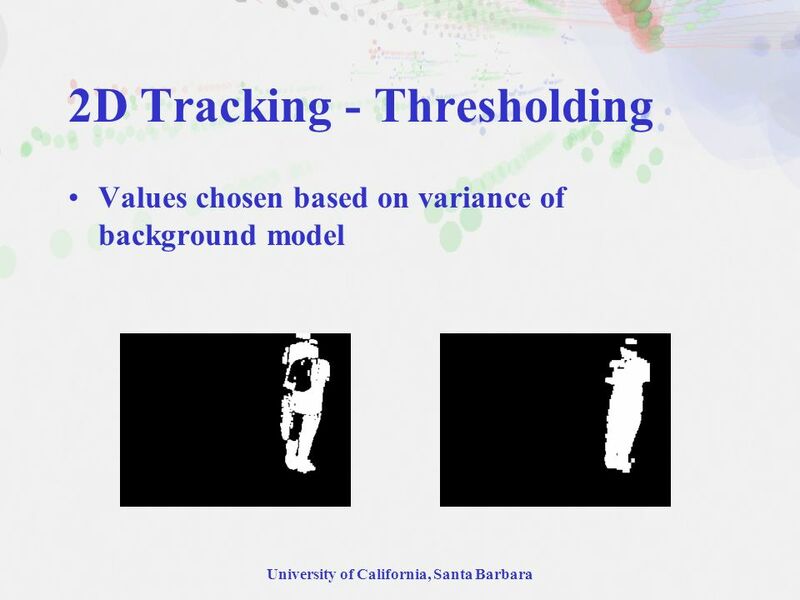 Real-Time Human Pose Recognition in Parts from Single Depth Images Presented by: Mohammad A. Gowayyed. 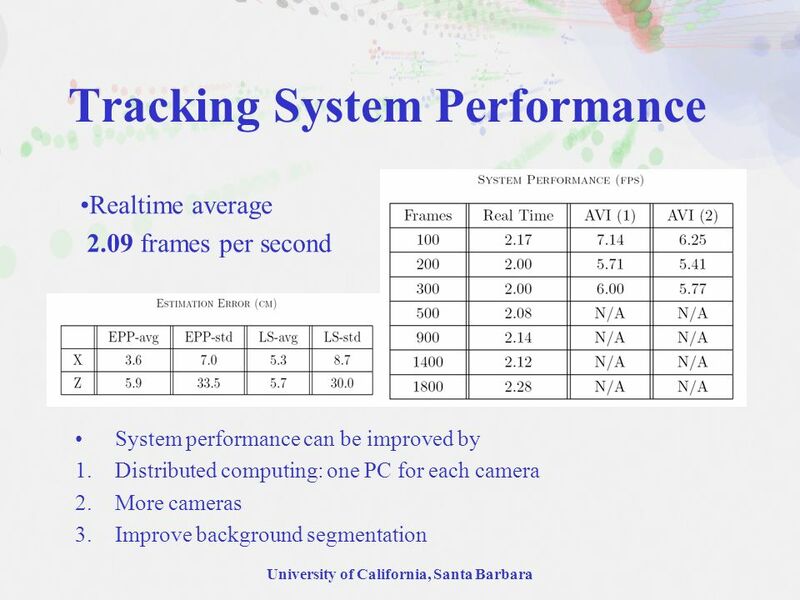 Computer vision. 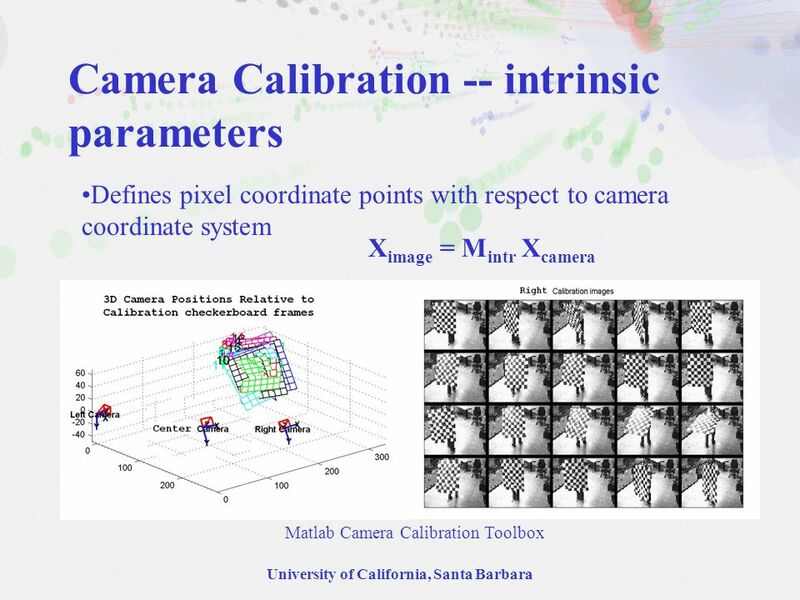 Camera Calibration Camera Calibration ToolBox – Intrinsic parameters Focal length: The focal length in pixels is stored in the. 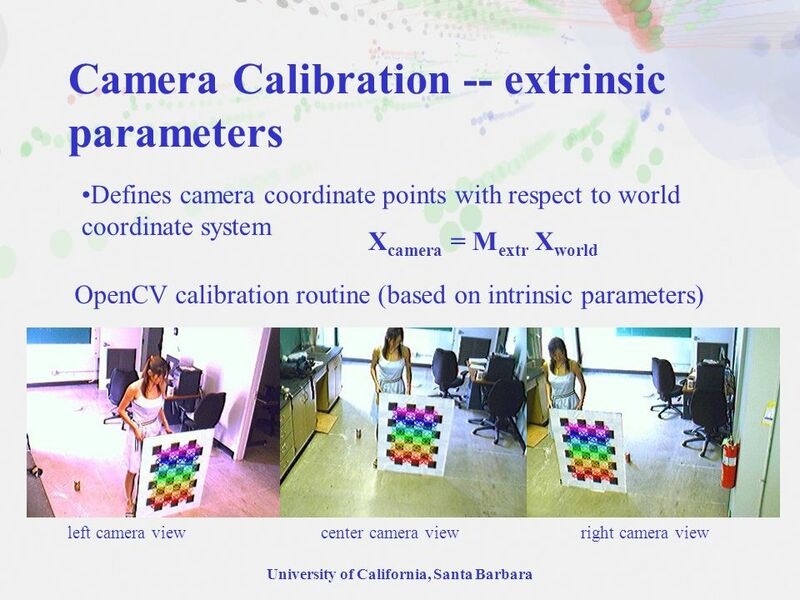 GIS and Image Processing for Environmental Analysis with Outdoor Mobile Robots School of Electrical & Electronic Engineering Queen’s University Belfast. 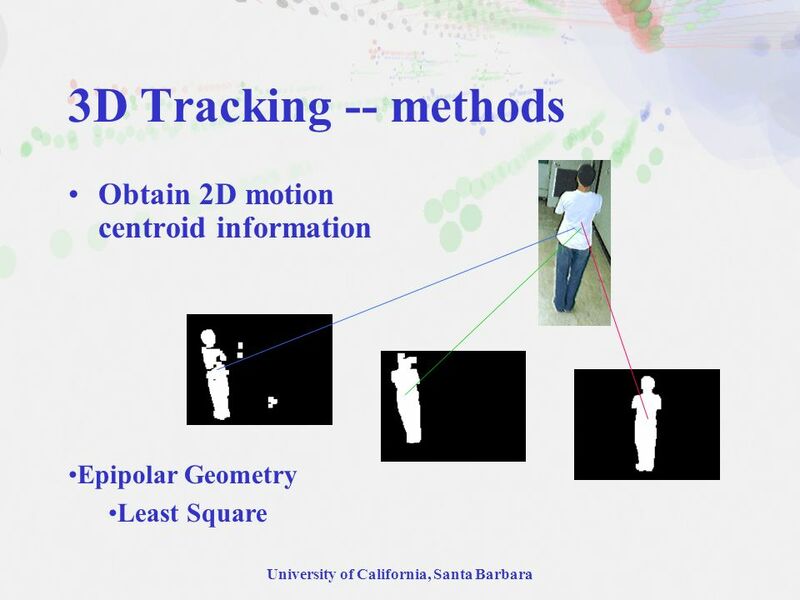 Virtual Dart: An Augmented Reality Game on Mobile Device Supervisor: Professor Michael R. Lyu Prepared by: Lai Chung Sum Siu Ho Tung. 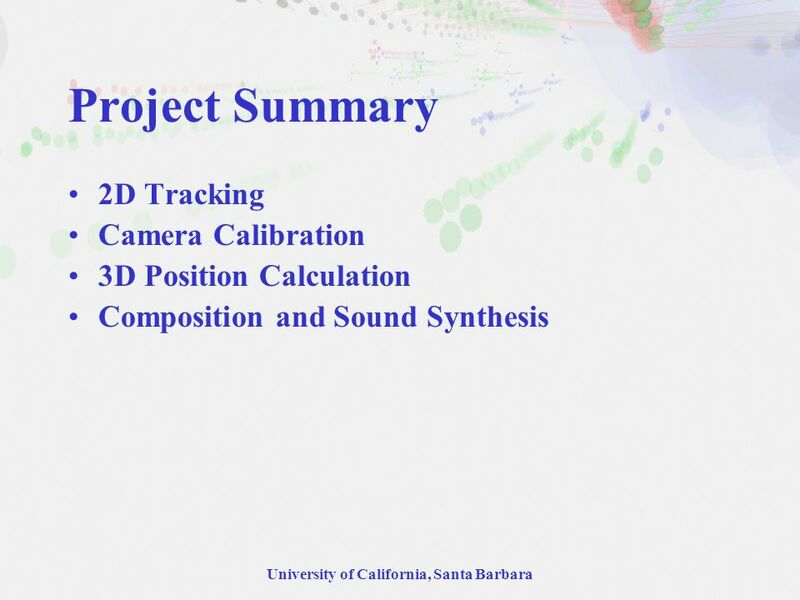 ECE 7340: Building Intelligent Robots QUALITATIVE NAVIGATION FOR MOBILE ROBOTS Tod S. Levitt Daryl T. Lawton Presented by: Aniket Samant. 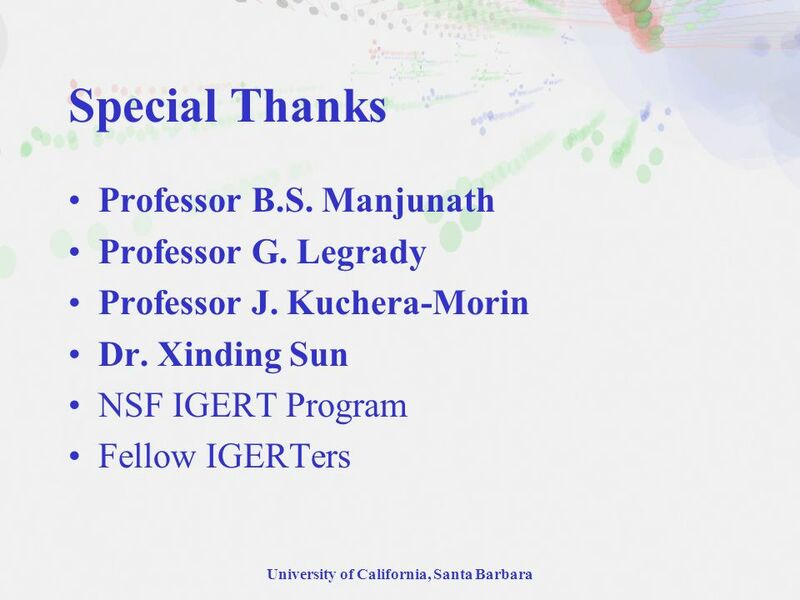 John A. Bender Applications in Real-time 3D Tracking Collaborators: Pietro Perona Luis Goncalves Ken Goldberg Karl Chen Ilan Lobel Steve Nowlin. MSU CSE 240 Fall 2003 Stockman CV: 3D to 2D mathematics Perspective transformation; camera calibration; stereo computation; and more. 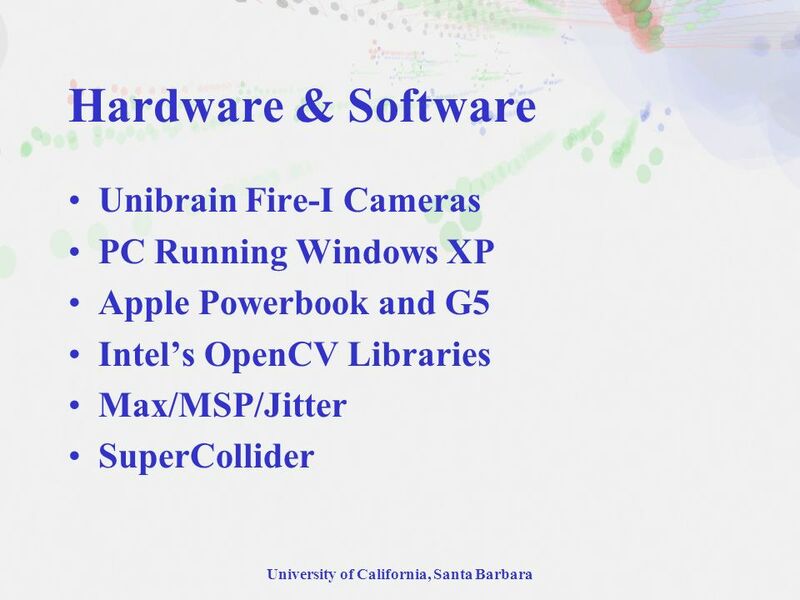 MUltimo3-D: a Testbed for Multimodel 3-D PC Presenter: Yi Shi & Saul Rodriguez March 14, 2008. 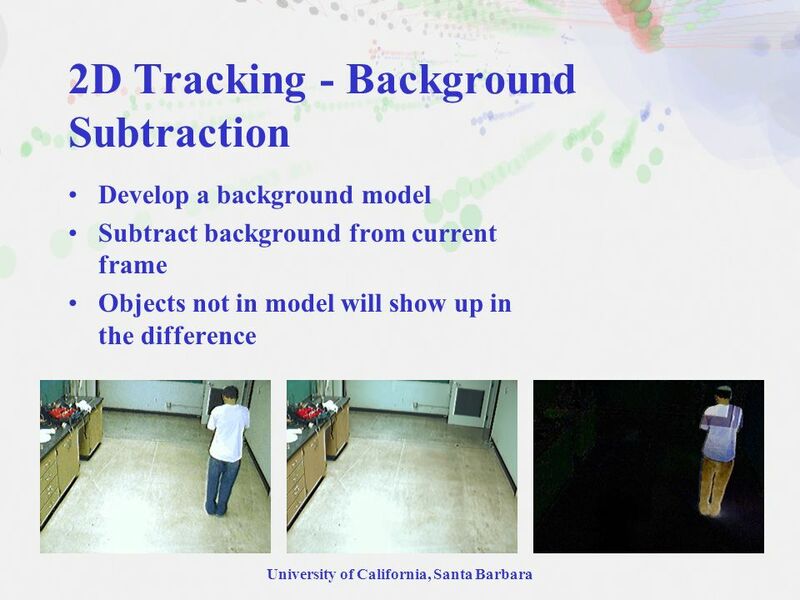 Motion based Correspondence for Distributed 3D tracking of multiple dim objects Ashok Veeraraghavan. Tracking Migratory Birds Around Large Structures Presented by: Arik Brooks and Nicholas Patrick Advisors: Dr. Huggins, Dr. Schertz, and Dr. Stewart Senior.